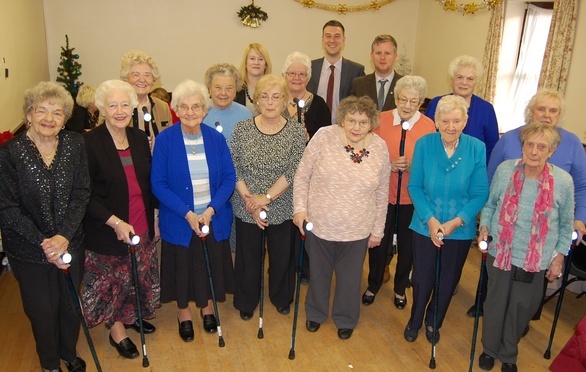 We have provided 12 members of Gateshead Older People’s Assembly with walking sticks that have a light and an alarm integrated into the handle. This was made possible after the Older People’s Assembly applied for £360 of funding from the Muckle LLP Fund which is managed by the Community Foundation. The Assembly’s Development Manager, Craig Bankhead, said “The chair of our Charity, Esther Ward, came into the office one day with a brand new walking stick that had a light on the front as well as an alarm for emergencies. She was very pleased with it as it means that walking down steps in the dark or finding the keyhole in her front door are now much easier as a result. The charity, which is based in Deckham in Gateshead, has more than 2,000 members and runs friendship groups, wellness sessions, a community cafe and a whole range of other projects and activities aimed at promoting the wellbeing of older people in the borough. The organisation also provides many opportunities for older volunteers who provide support for their own communities. For more information on our Community Foundation fund, please contact Hugh Welch on 0191 211 7903. Alternatively contact Gateshead Older People’s Assembly, email [email protected] or call 0191 438 1721.